‘The Client’ is defined as any person, company, corporation individuals, limited liability partnership who instructs, authorizes, conducts or otherwise engages TRANSCARS SPAIN in the transport, storage, repair, movement of vehicles, cars or any type of cargo. ‘The Company’ is defined as TRANSCARS SPAIN or any of its subsidiaries or parent companies. 1. The Company undertakes to transport and/or compound certain vehicles for the client in accordance with the instructions of the client (‘the service’). 2. All invoices are due for payment 14 days after the date of the invoice where account facilities have been previously agreed in writing. Any invoice outstanding beyond this period will be referred to a Debt Collections Agents and will be subject to surcharge of 15% plus vat to cover the collection costs incurred. This surcharge together with all other charges and legal fees incurred will be the responsibility of the customer and will be legally enforceable. All debts remaining unpaid after 30 days will be subject to Clause 21. below. 3. Any quotations shall, if not previously accepted, expire 7 days after issue after which time the Company may vary any or all elements of the quotation without notice. 4. Any estimates made by The Company as to the date or dates upon which the services will be undertaken will be confirmed by The Company on the acceptance of the quotation. 5. Any estimates made to the date and time of the completion of the services or any element of the services are only business estimates and in the event that completion is delayed, or the Company refuse to release a vehicle for any reason, no liability direct, indirect or otherwise will accrue to The Company. 6. In the event that the client shall require the services to be performed on a regular basis or on multiple vehicles or multiple batches of vehicles the client undertakes to keep the Company appraised of its prospective requirements at least 5 days ahead of such service being required. 7. The Client shall issue The Company with sufficient information to identity the vehicle or vehicles, which are to be transported and or upon which the client requires the services to be performed and in the case of transportation confirmation of the delivery address and where appropriate written authority to collect or remove the vehicle or vehicles in question. If the specification, description, make, model, dimensions of the vehicle(s) changes between order and collection time then the company reserves the right to change the previously quoted price and/or the terms of carriage including restricting insurance liability. 7a.Goods in Transit Insurance Liability will not commence until a vehicle is signed for by the agent and fully loaded on a transporter. 7b. TRANSCARS SPAIN does not accept any liability for any loose items that may be within the confines of the vehicle inc. the boot and/or any attached boxes/trailers or luggage/bike carriers. 8. In the event that The Company is unable to effect delivery of any vehicle The Company will take such vehicle to a secure store for collection either by the client or the person to whom they were to have been delivered to or for The Company to attempt on the instructions of the client a second delivery. All costs for the removal of the vehicle to secure storage. The charges for the secure storage the collection from the secure storage and any further attempted delivery shall be in addition to the delivery cost contained in the quotation and shall be the responsibility of the client. Whilst in storage, risk in the vehicles shall vest in the client. 9. In the event that the client shall cancel any demand or any instruction to The Company, on less than one working day’s notice and in on to all other services five working day’s notice, a cancellation or amendment fee equal to The Company’s charges for the services shall be payable to The Company. 10. The Client warrants that it is the owner of the vehicles or that its principles are entitled to part with or take possession of (as the case may be) and undertake the modifications to the vehicles and the Client claim that the Client was not appropriately authorised. 11. The Client warrants that the vehicles are in a condition which will not constitute a danger to any person if driven in a responsibile manner or a suitably trained operative undertakes the services on the vehicles are in a condition which will not constitute a danger from components detached or fluids leaking if the vehicles are transported in the normal manner. 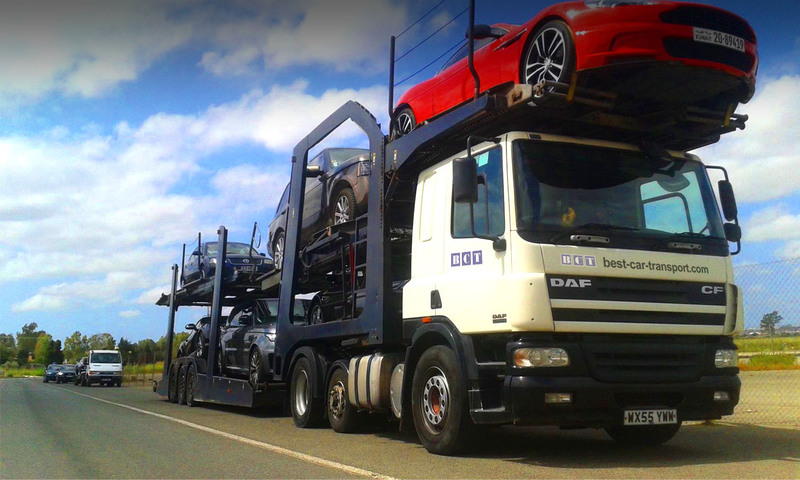 If the client authorises the loading/unloading of vehicles using its own staff then the Company will not be liable for damage or loss or personal injury during the loading/unloading process. 12. The Client will indemnify The Company and The Company’s employees and subcontract labour against any claim or liability if the Client instructs The Company to park or drive any vehicle on the public highway and that vehicle is not in a fit state to be used on the public highway. 13. The Client will indemnify The Company may have to its employees and subcontract labour arising out of any breach by any third party of the Health and Safety legislation including but not limited to the Client and any occupier of property to which the vehicle are to be delivered or collected from. 14. The Company undertakes to indemnify the client in respect of any liability that may arise as a result of The Company not complying with all relevant laws and regulations in undertaking the services on behalf of the client. 15. The Client undertakes that it will keep the Company fully appraised of any industrial dispute that the client might have whether or not such dispute is with a recognised trades union in order that The Company can assess whether or not to continue to provide the services to the Client is likely or possible give rise to industrial action against The Company. 17. In the event that the Client shall fail to settle invoices as they fall due The Company reserves the right to exercises a lien over such vehicles of The Company shall have custody of irrespective of whether or not The Company shall have undertaken any of the services on the vehicles on the vehicles that are subject to lien. 18. The Company reserves the right to factor, sell, discount or pledge any underpaid bill whether or not it is outstanding. 19. The Client shall not be entitled to exercise set off in respect of any underpaid amount due from The Company and The Company shall be entitled to apply cash received in any order or sequence as The Company shall at its discretion determine. 20. The Client shall be responsible for any VAT or other duty, tax or other liability that may fall due in respect of the Services and in so far as The Company may be required to pay and recover such sums this shall not affect The Client’s liability to pay such sums. 21. The Client shall be responsible for all debts incurred by the actions of its employees, agents or directors. If the client is a limited company then the Directors agree to personally guarantee any debts incurred by the company of which they are company officers. If the client is a limited liability partnership (LLP), then each member agrees to individually liable for all outstanding monies owed to TRANSCARS SPAIN. 22. The Company shall have the right to utilise subcontract labour, facilities and subcontract labour, facilities and subcontract vehicles in the discharge of its obligations to perform the service. 23. The Company shall be responsible for the vehicles from the point at which the Client or the Client’s agent shall give possession of them to The Company and shall have certified the condition and completeness of the vehicles as the case may be and The Company shall cease to be responsible for the vehicles on handling them to the Client or a third party whether or not such party certifies the completeness and condition of the vehicles. Third Parties, Clients or any other persons may not enter, mount, board or otherwise engage with vehicles belonging to the Company without obtaining written permission first. Any person who boards a vehicle does so at their own risk, the company will accept no liability whatsoever for personal injury. 24. The Company will maintain insurance with a reputable underwriter in respect of loss or damage to vehicles whilst in the Company’s possession and statutory responsibilities in The Company’s occupation of property, employment of staff and the conduct of business. The Company will only provide insurance, and accept liability for, vehicles carried by its’ transporters.The company does not provide or offer insurance for consequential loss including car hire, loss of earnings, loss of profit, loss of time – this list is not exhaustive. Any client vehicle that is delivered, collected or moved via any other means is exempt from insurance and the company will not accept any liability for any claim howsoever arising unless previously agreed in writing with the client. All vehicles will be insured under CMR Convention when travelling through Europe and under these Terms within the UK unless otherwise agreed in WRITING at the time of booking. 25. The Company will not be responsible for losses arising from Act of God, industrial action, manufacturing defect, adverse weather conditions,unavoidable traffic delays, change in vehicle specification, actions of persons not employed by the company, industrial fallout contamination, airborne corrosives, cleanliness of trucks or any other circumstances that could not reasonably been prevented or avoided by the Company. 26. The Company will not be responsible for any consequential losses of any kind howsoever arising suffered by the Client or any third party. 27. The Client will submit all claims against The Company and The Company’s insurers within 2 days of the loss or damage occurring in accordance with the procedure from time to time determined by The Company and any failure to follow such procedure will void the Company’s liability to the Client. All claims must be submitted in writing under separate cover. The Company reserves the right to retain ownership of all replaced parts and may withhold payment until these are forthcoming. Any claim for loss or damage after this time will be automatically considered void. 27a. The company will not be held responsible for any contract made by the Client with a 3rd party inc. binding Service Level Agreements and other written or verbal contracts. 28. Any failure by either party to enforce their rights shall not constitute a waiver of the rights of either party. 29. Any rights accruing to either party at or after completion, termination of this agreement shall survive such event. 30. English law shall govern all arrangements between The Company and The Client. 31. All vehicles must be paid for on delivery or collection unless previously agreed in writing. Payments must be made by credit/debit card or cash. Personal cheques are not accepted and clearance must be obtained on company cheques prior to release cars. 32. If you have any doubts about being bound by these terms, please ask BEFORE you accept a quotation or offer any form of instruction to the company. (a) TRANSCARS SPAIN (‘TRANSCARS SPAIN’) is authorised to collect the Motor Vehicle from designated pickup area and move the Motor Vehicle to the Storage Area. (b) TRANSCARS SPAIN will return the Motor Vehicle from the Storage Area to the designated drop off area at the end of the storage period. (c) In circumstances where the client has taken advantage of the Shuttle service, but for reasons beyond our control the vehicle has not been stored at TRANSCARS SPAIN. The client will be charged our normal pick up and drop off charges (to and from) the airport. (d) TRANSCARS SPAIN will perform any other services as the parties agree. TRANSCARS SPAIN may relocate the Motor Vehicle within the Storage Area or to other premises under the control of TRANSCARS SPAIN without notice to the Owner. 3.1 The Owner must pay for the vehicle storage at the rates current at the commencement of the Storage Period. 3.3 The Owner must pay TRANSCARS SPAIN charges for any other services performed by TRANSCARS SPAIN a and any Storage in excess of the Storage Period at the rates set by TRANSCARS SPAIN from time to time. 3.6 If the owner of the vehicle defaults on their payment, TRANSCARS SPAIN has the authority to debit the credit card details provided by the owner of the vehicle and to put through transactions without the owner of the vehicle being present. Including but not limited to: any outstanding amounts owing for storage and any other service fees incurred before, during or after storage. Payments will be deducted from the credit card details provided by the owner of the vehicle at completion of storage and/or during storage at fortnightly intervals (which ever is deemed most convenient by TRANSCARS SPAIN Accounts department). (c) Any remaining surplus of the sale proceeds, after TRANSCARS SPAIN makes any deduction under paragraph (b) of this clause, shall be sent by TRANSCARS SPAIN to the Owner at the Owner’s last known address but if the Owner cannot, after reasonable endeavours, be located, the Owner hereby irrevocably authorises TRANSCARS SPAIN to donate the surplus sale proceeds to a charity of TRANSCARS SPAIN’s choice. 5.1 Unless prior written agreement is reached with TRANSCARS SPAIN, if a Motor Vehicle remains at the Storage Area for a period in excess of 60 days or if a Motor Vehicle remains at the Storage Area for a period in excess of 60 days after the expiration of the Storage Period then the Motor Vehicle will be deemed abandoned and the Owner authorises TRANSCARS SPAIN to deal with the Motor Vehicle in any manner that TRANSCARS SPAIN deems fit, including but not limited to moving the Motor Vehicle to other premises or disposing of the Motor Vehicle. (d) The Owner has not agrees to sell the Motor Vehicle. 6.2 If any act, matter or thing occurs or becomes known to the Owner which is inconsistent with the warranties and representations contained in this clause, the Owner must immediately give TRANSCARS SPAIN written notice of that act, matter or thing. (d) TRANSCARS SPAIN provides storage services only and does not necessarily store motor vehicles according to manufacturers’ requirements or any other special requirements unless the Owner and TRANSCARS SPAIN agree to such requirements and the Owner agrees to pay additional charges as set from time to time. 7.2 The Owner uses the services of TRANSCARS SPAIN (including the storage of the Motor Vehicle) at own risk and in particular, the risk in the Motor Vehicle remains with the Owner. (d) Caused by reason of the Motor Vehicle being stored outside. 8.1 Any claims made by the Owner with respect to the condition of the Motor Vehicle after the Storage Period must be made within one hour if the Motor Vehicle being returned to the Owner by TRANSCARS SPAIN. The Owner releases and forever holds harmless TRANSCARS SPAIN for any claims not notified to TRANSCARS SPAIN in that time. 8.2 If the Owner fails to complete a condition report at the beginning of the Storage Period than TRANSCARS SPAIN may (although is not obliged to) complete a condition report, in which case the Owner accepts this condition report. If TRANSCARS SPAIN does not complete a condition report, then the Owner forfeits any right the Owner may have either in law or in equity against TRANSCARS SPAIN with respect to the condition of the Motor Vehicle. 9.1 The Owner must notify TRANSCARS SPAIN immediately of and change in the Owner’s address or contact details (including the Alternative Contacts). TRANSCARS SPAIN may serve any notice by forwarding it by post to the address last notified by the Owner and the notice shall be deemed to have been received on the day that the Notice should have arrived in the ordinary course of the post. 10.1 Without limiting any other right or remedy available to TRANSCARS SPAIN, whether under this Agreement, at law, in equity or otherwise, the Owner agrees to pay to TRANSCARS SPAIN interest on any amount due to TRANSCARS SPAIN under this Agreement at the rate 2.5% for each month or part of a month that such amounts remain unpaid after the due date for payment. If TRANSCARS SPAIN obtains a judgement against the Owner, the Owner must pay interest on the amount of the judgement at the higher of the rate prescribed by legislation or the rate specified under this clause for each month or part of the month that the judgement remains unpaid. 11.1 TRANSCARS SPAIN reserves the right to impose conditions as to the time and manner of access to the Motor Vehicle by the Owner or any person authorised by the Owner and is not obliged to provide access to the Motor Vehicle or to permit its removal from the premises unless TRANSCARS SPAIN is satisfied that the person or persons seeking access to the Motor Vehicle are properly authorised by the Owner. 11.2 TRANSCARS SPAIN shall be entitled to refuse access to the Motor Vehicle and to prevent its removal where moneys are owing by the Owner to TRANSCARS SPAIN or if TRANSCARS SPAIN exercises its lien pursuant to clause 4. 11.3 The Owner must pay TRANSCARS SPAIN the applicable storage fee for any period which TRANSCARS SPAIN retains possession of the Motor Vehicle as a consequence of the exercise of the lien referred to in clause 4 and that lien shall extend over any storage fee charged pursuant to this clause. 12.1 TRANSCARS SPAIN or the Owner may terminate this Agreement at any time by giving the other 1 days written notice. 12.2 If the Owner breaches this Agreement than TRANSCARS SPAIN may immediately terminate this Agreement by written notice to the Owner. 12.3 Upon termination of this Agreement (whether by termination under this clause or otherwise) the Owner must immediately remove the Motor Vehicle from the Storage Area and pay all outstanding storage fees and other money payable to TRANSCARS SPAIN pursuant to this Agreement. For the purpose of this provision, storage fees will continue to accrue from the date of termination until the date of removal. 12.4 The expiry of this Agreement (wether by termination under this clause or otherwise) shall not prejudice or effect any rights or remedies available to TRANSCARS SPAIN under this Agreement, at law, in equity or otherwise. (d) Must comply with all reasonable directions given to the Owner by TRANSCARS SPAIN’s employees charged with the administration of the storage area. 14.1 The Owner authorises TRANSCARS SPAIN as its agent to drive the Motor Vehicle where necessary, including, its employees and its agents. 15.1 The Owner authorises TRANSCARS SPAIN to charge the Owner’s credit card for any payments that are due and owing to TRANSCARS SPAIN by the Owner under this Agreement. 16.1 TRANSCARS SPAIN holds all information it obtains about the Owner pursuant to the Privacy Principles of the Privacy Act 1988. 16.2 Information is collected for the purposes of carrying out this Agreement or enforcing the TRANSCARS SPAIN’s rights under this Agreement. 17.1 This Agreement is governed by the law of England. 17.3 Any legal action in relation to this Agreement may be brought in any court of competent jurisdiction sitting at, England. 17.4 No failure, delay, relation or indulgence on the part of TRANSCARS SPAIN in exercising and power or right conferred under this Agreement shall operate as a waiver of such power or right, nor shall any single or partial exercise of any such power or right preclude any other or future exercise thereof or the exercise of any power or right under this Agreement. 17.5 If any provision of this Agreement is illegal, void, invalid or unenforceable, all other provisions which are capable of separate enforcement shall be and continue to be valid and enforceable. 17.8 The term Motor Vehicle includes all fitting, plant and equipment and chattels in or for use in connection with the Motor Vehicle. 18.1 These terms and conditions are valid from 3rd April 2009 for all vehicle owners, including those vehicles in storage prior to this date. TRANSCARS SPAIN retains the right to modify the terms and conditions at any time without notice to vehicle owners.